Global Marijuana March. And: By year. Click images to enlarge, and for info. Share links: crowd or crowds. And: Some years: 2018 photos. 2017. 2016. 2015. 2014. 2013. 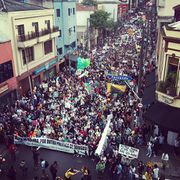 Google images of crowds and flyers: Marcha da Maconha. And: Marche Mondiale du Cannabis. 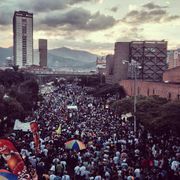 And: Marcha Mundial de la Marihuana. And: Global Marijuana March. Add city name to searches. Search for marijuana march videos. And more. Cannabis March featured crowd photos. Global Marijuana March by year. Later years have more photos. 420 and Global Marijuana March event lists by year. Reports, photos, videos. See: yearly photo albums of Facebook fan page: Global Marijuana March. Cape Town, South Africa. May 5, 2018. See source, with more photos. Sao Paulo, Brazil. May 26, 2018. See source. 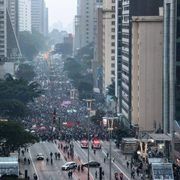 Part of "Green May" (many cities)  in Brazil. See another 2018 photo. See video showing massive crowd (from 1 minute on, especially the time lapse video). Sao Paulo, Brazil. May 6, 2017. See source. Cape Town, South Africa. May 7, 2016. See source. Athens, Greece. May 9, 2015. See source, and more photos. Buenos Aires, Argentina. May 3, 2014. See source. . See also: 2012 May 5 photo. 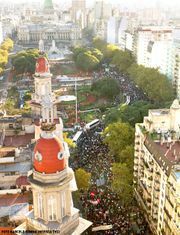 Buenos Aires, Argentina. May 4, 2013. See source. . See street-level crowd shot. Medellin, Colombia. May 5, 2012. See more photos: a, b, c.
Sao Paulo, Brazil. May 19, 2012. See another photo. Toronto, Canada. May 2, 2009. Toronto, Canada. May 6, 2006. May 8, 2004 in Madrid, Spain. Million Joint March (La Marcha del Millón de Porros en Madrid, Mayo 2004). See source. . For more info and photos: . May 4, 2002 in Paris, France in front of the Hotel de Ville. See a source. . This page was last edited on 18 December 2018, at 12:24.